Update on mom: she is much better, she is now home and improving daily, the blood clots in her legs and lungs are apparently starting to dissolve as she is noticing a big difference in her ability to breathe. A good thing, no? I’m staying in Daytona for a while to be home health care while she needs it. Update on me: I’ve gone temporarily insane as I have agreed to homeschool my kids for the next week (plus the week of catch up we have to play since my kids were out of school all week) so that I could help my mom get back on her feet! That means my kids were all out all this week…they’re going to be home all next week…then the week after that is our Thanksgiving holiday…3 freaking weeks without school. This is all my mom’s fault, she owes me and can’t even cop the excuse that she spent days in labor…I’m adopted! Update on the kids: They have 3 freaking weeks without school…they are ecstatic! Who could blame them? I have found my new favorite thing in the whole world and I hope that Peter will stop looking right this second so that he doesn’t totally ruin one of his Christmas gifts…but this is something so geeky and fantastic that I have to share it with you BEFORE the holidays so you can have a chance to thrill your beloved as well. Ta-Da! 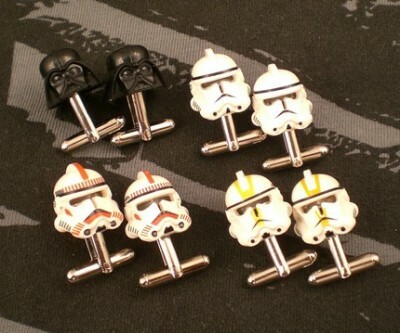 Star Wars cuff links. I KNOW! Shut UP, right?! Posted in: daily posts, events and happenings, Holidays, Mayhew niblets, Mom memoirs, picture fun, we are a little crazy. I am thrilled that your mom is recovering so well. I’ve been so worried about her health. (and your sanity) Don’t worry about the kids and school. I am sure you are doing a great job and they have recovered from far greater obstacles. Missing you in Brandon. How far is Daytona from Miami? We will be there next week. Great news about your mom! Good luck with the kids – you’re a better person than I.
Cuff links are very fun! Hang in there!!! The three weeks may seem like forever but eventually the time will pass. So glad that your mom is doing better. Good luck with the home schooling thing! My mom home schooled for over 20 years… Still don’t know how she did it. 3 weeks without school??? Are you guys on a track system? Jen Ws last blog post..He’s going to the chapel and he’s gonna get married. Sorry, hit submit too soon… and I’m so glad your mom is doing better! My daughter wanted to be home schooled. When I explained the cirriculum doesn’t include 6 hours of Disney Channel a day, she clammed up. I’m so glad your mom is doing better! Good luck with the homeschooling though – that’s gotta seriously cut into blogging time. The cufflinks? I take it you married a nerd like I did. If I was classy enough to wear cufflinks, I’d be all over those. Uhm, I know Star Wars is neat and all, but aren’t those the BAD guys of Star Wars? Glad your Mom is better. No way you are not as good as any school teacher. Still, good luck. Chuckling as I click submit….